LaGrange, Ga—Interface has launched two new carpet tiles, Naturally Weathered and Nature’s Course. Both products are available in color palettes grounded in complex neutrals. Naturally Weathered is inspired by traditional clapboard and shingles made from cedar or white oak, which are intentionally left unfinished and exposed to the elements. The product brings a palette of grays inside to the workplace with eight variations in Interface’s Skinny Planks. 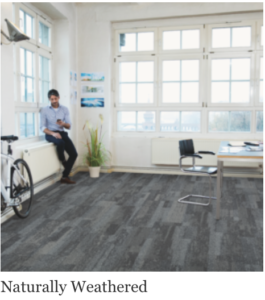 Naturally Weathered is made with 100% recycled content nylon and is part of Interface’s i2 product family, designed to eliminate any concerns with blending different dye lots or selective replacement. Nature’s Course showcases a timeless patterning in a sophisticated palette of eight complex neutrals and is inspired by biophilic design. With random patterns, Nature’s Course moves across the floor in a truly organic way. It is made with 100% recycled content nylon and is part of Interface’s i2 product family, designed to eliminate any concerns with blending different dye lots or selective replacement. All Interface products globally are completely carbon neutral based on the total product lifecycle and at no extra cost to our customers.